My first two weeks of biking across Norway were absolutely wonderful. I completed my bike tour across Denmark, Norway and Sweden with Pablo and Ana and their dog Hippie… and then I spent an additional ten days touring around the Hardangerfjord and Sunnhordland regions east of Bergen with my friend Eric Kiraly. Upon finishing our self-guided bike tour in Bergen, Eric and I jumped on the night train and traveled back to Oslo, Norway (where Eric and I had first met up). We arrived in Oslo early in the morning and weren’t able to check into the AirBNB apartment we had rented there until later that day, so we walked around the city a little bit and then spend most of the morning at a small park located just north of the city center. When the time came for us to check into the apartment we had rented, we slowly made our way across town, through the main pedestrian street in the center of the city, and toward the Oslo central train station. It was here, on Karl Johans Gate, that I noticed a tall, well-built man walking at my side… and he seemed to be following us. It’s fairly common for people to stare at me and my fully-loaded touring bicycle as I walk past, so I don’t think much of it. But then the man suddenly approached me with his arm extended outward and his phone in his hand. He shoved the phone in front of my face and said, “Is this you?” Squinting into the afternoon sun, I looked at the man’s phone, and yes, it was me! He was looking at my Bicycle Touring Pro Instagram account. Turns out the man who had been following me was named Ulrik. He’s a young Oslo native who, just three years ago, had visited www.bicycletouringpro.com in order to learn how to conduct his own bike tour in Norway. 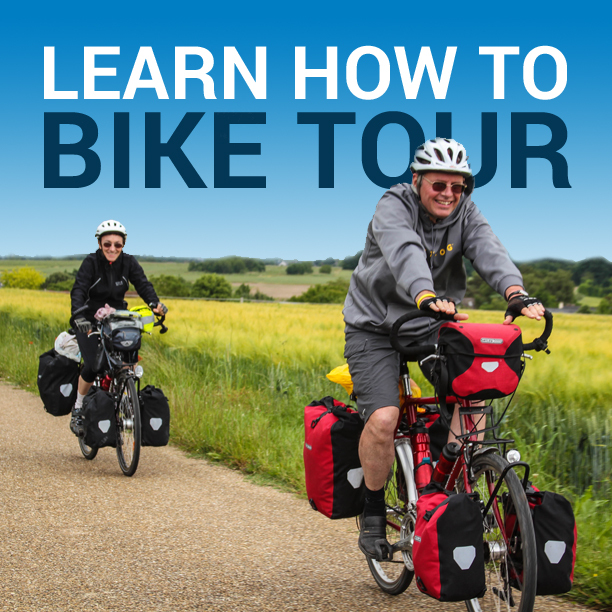 He took the information he found on the website and conducted a memorable, long-distance bicycle tour in his home country. He was quick to tell me, the bike tour totally changed his life! It’s not often that I am recognized on the street, but it does happen on occasion, and I love it when it does. Totally makes my day! Just a couple hours after Eric and I checked into our AirBNB apartment, Rob arrived in Oslo. He texted me from the airport saying that he had arrived and that he’d be at the apartment shortly. It took him some time, however, to take the train from the airport to the Oslo central station and then carry his packed bicycle and all of his things to the apartment. As soon as Rob arrived at the apartment, I introduced him to Eric, and he set to work on assembling his bicycle. Eric and I had a long day and we both were pretty tired, so just a few hours after Rob arrived, we both went to sleep while Rob went out and took some photos of the city (see his two photos above). The next morning, we woke up early, took showers, ate breakfast, cleaned the apartment and then walked out onto the street. Rob and I walked our fully-loaded bicycles the few blocks to the train station and it was here that we said goodbye to Eric. After almost two full weeks in Norway, it was finally time for Eric to return home. So Eric took a train back to the Oslo airport and Rob and I continued from there to a nearby bicycle shop where we met a small group of tourists who had signed up to participate in a guided bicycle tour of the Oslo city center. Leading the bike tour was a charismatic Englishman named Paul. He welcomed us to Oslo, told us that the bike tour would begin in just a few moments, and then asked us to wait. A few minutes later, we were on the street, standing over our bicycles and following Paul (and his blond-haired assistant Ricky) across the streets of Oslo. On the bike tour with us were about a dozen other people. And frankly, I was just as interested in the people on the bike tour as the actual bike tour itself. Everyone on the tour with us seemed to have a story… and they were all such nice people. Sometimes I hear from people that they believe the world is a scary, horrible place. But I think these people have been watching too much TV and haven’t left the comfort of their home for a very long time. I’ve traveled all around the world and I can tell you that for the most part, the world is a very friendly place. Most people are good, kind, caring people. Yes, there are problems in the world… and yes, there are people who do bad things. But for the most part, the world is full of good people! The highlight of the bike tour was Vigeland Sculpture Park – where there are hundreds of statues of naked people on display all around the park – on the sides of the bridge, in the water fountain, at the top of the nearby hill, etc. They’re everywhere! And best of all, you’re allowed to climb on the statues. In fact, it’s practically encouraged (which is also kind of weird when you think about it). As soon as the bike tour was over, Rob and I said goodbye to all the new friends we had made and then we immediately began cycling west out of the city. By this time in the day it was already well after 4 PM and we were hoping to get about 60 km or more outside the city center before calling it a day. Luckily, getting out of Oslo was just as easy as it was getting in. The city’s many bike paths make zipping in and out of the city center a total breeze, and it was thanks to these well-signed bike paths that Rob and I were able to cycle about 8 km beyond the city of Drammen (which is about 60 km southwest of Oslo). Here, on a quite suburban road, I saw what looked like a place to camp in a hillside forest. We pushed our bicycles up a steep, rocky trail and then (totally by accident) stumbled across one of the best campsites I have ever happened across on my travels anywhere in the world. At this remote, unmarked campsite was a fire-pit, logs to sit on, a lean-to shelter, a small supply of firewood, and plenty of flat places to pitch our two tents. After setting up camp, we made a small campfire and then called it a night. It had been a long day and we both knew that there was lots of cycling ahead of us. We woke the next morning feeling good. After packing up our things, we hit the road and cycled west through the city of Hokkund and then south to Kongesberg. Once in Kongesberg, we resupplied on food and water and stopped for a short lunch break on the edge of the river where a large waterfall was crashing over the rocks and earth below. Then we cycled north-west, traveling for two full days on highway 40. I didn’t take many photos of this leg of the tour, but I did shoot a lot of video, so you’ll have to wait until later to watch the YouTube videos I made from this part of the journey. While I don’t have many photos of us on Highway 40, I can tell you that this particular road was almost entirely car free, super smooth, and had some of the most beautiful scenery I’ve seen in all of Europe. The road was beyond fantastic! I absolutely loved it… and I would recommend this road to anyone traveling through Norway on a bicycle. It’s an absolutely perfect bicycle touring route. During our second day on the 40, Rob and I encountered a series of three steep uphill climbs – the first of which was the worst. We tackled the first major hill in a slow, but steady fashion. As we got higher up, the visibility dropped and the rain increased. By the time we reached the summit, we were both cold and dripping wet. So we cycled down the hill a short ways and almost immediately went dashing into the nearby bushes, trying to find a place to camp for the night. We settled on a relatively flat patch of earth next to someone’s abandoned summer home. We pitched our tents as quickly as we could and them jumped inside, spending the next several hours trying to dry out our things and get warm. It was a long, cold night, but we survived. We woke the next morning, packed up our wet items as best we could, and the continued down the road, only to tackle the two remaining hills. At the bottom of the first hill of the day was a large rest area… and inside this rest area was a place where we could take a shower… for FREE. After a cold, wet night in our tents, Rob and I couldn’t pass up on this opportunity. We left our bicycles outside the shower door and then quickly took one of the best showers of our lives. We were so surprised to have come across a shower… seemingly out in the middle of nowhere. And it was free, which made it even better! As much as Rob and I both enjoyed cycling on Norway’s highway 40, we were both extremely glad to have reached the road’s northern-most point and the city of Geilo. We stopped in town to rest, stock up on food and water for the next leg of our journey, and eat a quick lunch. The town was really nice and looked like it would have been a great place to come and ski during the winter months. Cycling west out of Geilo was dramatically different to cycling on the 40. The road was narrower, there was a lot more traffic, and it seemed as though we were constantly going uphill. We did, however, eventually reach a point in the road where we were sure we must be near the top. But it was here, near the town of Haugastol, that we ran into a roadblock. Just past the large bike shop on the side of the road was a massive sign in the road warning that the road was closed to cyclists due to a landslide. When we inquired inside the bike shop as to whether or not we could continue down the road on our bicycles, they said that we could try, but that we’d likely have to wait for the bus at some point to take us through one of Norway’s many long underground tunnels. To make a long story short, we were stuck! But there was another option actually. Instead of cycling all the way to Bergen on the road (as we had initially planned), we could take a more scenic route to the north on a gravel road called the Rallarvegen. From here, we’d cycle for about 50 kilometers to the tiny town of Flam, and then take a train from there back to Bergen. It wouldn’t be the full “biking across Norway” bike trip we had planned, but it would definitely be an adventure! It didn’t take us long to decide that we were doing to abandon our original plans. We didn’t want to deal with the landslide in the road or with trying to catch a bus through the tunnel we knew would encounter along the way. So we decided to cycle north along the Rallarvegen, get as far as we possibly could, and then take the train back to Bergen. As soon as we got on the Rallarvegen, I was sure we had made the right decision. The views from the road were absolutely amazing! Plus, the sun was coming out (on occasion) and blessing us with some of the best weather we had experienced in days. There was some concern about the narrow road tires on Rob’s bicycle being able to handle the dirt and gravel road we were cycling on, but we pressed on anyway. The only thing I didn’t like about our bike tour on the Rallarvegen was the fact that there were so many places along the way that I wanted to stop and photograph. I could have easily spent a whole week cycling this 50 kilometers stretch of road because there were so many scenic viewpoints along the way. But Rob and I were in a bit of a rush. We really only had two more days to spend on the road. At the end of those two days, we needed to be back in Bergen because Rob’s girlfriend, Carrie, was flying in that day and we needed to be there for her arrival. So we pressed on and, sometime in the evening, pitched out tents in a remote mountain area between two small lakes. We had to carry our heavy bicycles over a small stream to get to this particular campsite and we both slipped on the rocks and got our feet wet while crossing over the water. So with soggy shoes, but positive attitudes, we set up our camp for the night, crawled inside our tents, and ate dinner. As the sun set over the lakes and mountains around us, Rob crawled out of his tent to take some photos of the sunset, and I stayed inside my tent to avoid being bitten by the mosquitoes. We spent the rest of the night calling back back and forth to one another from inside our tents about how beautiful and amazing the landscape was that we were currently in. Rob and I were in no rush to wake up early the following morning. After all, we thought, we only had about 40 kilometers to ride. We could take our time and reach the town of Flam (or Myrdal) in plenty of time. So we slept in late, took our time packing up our bicycles, and rolled out of camp sometime around noon. Back on the trail, we met several other bicycle tourists traveling down the Rallarvegen like we were. It was a bit strange for me, however, to go from seeing almost no other bicycle tourists to suddenly seeing dozens of them in a single day. Where were they all coming from? And were they simply cycling this short stretch of trail? Somewhere along the Rallarvegen was a small, red, wooden building. And inside this building was a young woman serving coffee and waffles. Rob ran inside and scarfed down the much-appreciate food, while I sat at a table and listened in on the conversations of the other young travelers inside the tiny roadside cafe. After a long waffle break, Rob and I hit the road once again, but we didn’t get far. Just a few kilometers after stopping for waffles, Rob got a flat tire. In fact, he blew out both of his bike tires in a single go. So we stopped on the side of the road and went to work. I repaired Rob’s rear tire while he worked on the front one. Then, after both tires were fixed and re-inflated, we continued down the road again, being more careful this time around about running into rocks or gravel that might cause another puncture. But once again, Rob yelled for me to stop. He had run into another rocky patch of road and had blown out both of his tires once again. The look of defeat on Rob’s face was horrific. We both knew that we were in trouble… and that we wouldn’t be getting much further on this rocky terrain. We stopped again and fixed both of Rob’s flat tires. But instead of cycling on like we had planned, we came up with an exit strategy. Instead of cycling all the way to Flam, Rob and I were simply going to walk the two short kilometers to the nearby town of Finse, and from there we’d jump on the train and travel back to Bergen. So we walked the bikes into Finse (the tiny town you see in the image below), bought train tickets back to Bergen, and then loaded our bikes onto the passing train. A couple hours later, we were in Bergen, Norway! As soon as we got off the train, Rob was in a rush to get to the place where we’d be staying – the home of his friends, Kjartan and Ingeborg. It didn’t take us long to cycle the 11 kilometers or so from the Bergen train station to the home of Rob’s friends, Kjartan and Ingebord (who had been kind enough to host not only Rob and his girlfriend, but me as well). Once at their home, we rolled our wet bicycles into the basement and went to work on drying out our things. Rob was given a small bedroom near the bikes and I was given a place to sleep on the floor of the family exercise room/office. After showering, dinner was made and I was introduced to the rest of the family (five kids and two visiting cousins). The following day, Rob’s girlfriend (Carrie) flew in from Amsterdam. Rob went to meet her at the airport while I stayed behind to catch up on a little computer work. Rob had been talking about Carrie practically the entire time we were cycling across Norway, so I was excited to meet her, and I wasn’t disappointed. Carry was outgoing, funny, and (even a little) crass. I liked her from the moment we first met. That night, Rob, Carrie, Kjartan and Ingeborg cooked pizzas for the entire family. I offered to help, but was ushered out of the kitchen and back down into the basement. Frankly, I couldn’t have helped much – even if I had been asked (as I am a truly terrible cook). But the pizza was delicious, and as we all sat around the table (all 11 of us), I was happy to have survived yet another incredible cycling experience… and to be in the company of such great people. This entry was posted in Bicycle Touring Pro Articles, Darren Alff's Bike Tour Blog, Europe, Featured Articles, Locations, Main Articles, Norway, Photos and tagged bergen norway, bicycle camping, bike camping, bike tour blog, biking norway, cycling norway, darren alff, norway, norway bike tour, oslo norway, rob, roberto lorusso, travel partners. This is the second article I have read from your site. The first one was Katelyn & Darren Bike Across Norway On the Fjord Cycling Route Bike Tour. I am just so excited to be able to hear of your experiences on the bike trip and for the photos of Norway. My Grandfather was originally from there, he died before I was born but I have always wondered what it was like where he came from. You camped outside of Drammen, this was the place he was born. I have taken one bike trip, I was amazed at the rewarding feeling I had when I was finished. Thank you so very much for sharing your experiences. Robin. Thanks for reading Robin… and for commenting as well. I’m glad I could make your day a little brighter in some small way. There was a map/route planning application shown in your first oslo-bergen video in youtube. Could you please share which kind of app you are using? When did you make this tour whith eric? I am asking because i am planing a tour in august/ september and i am still wandering about the weather. I realy appreciate your great youtube videos, its my 10 minutes of travelling time every week. This bike tour was in July 2015. I don’t think it really matters when you go to Norway. No matter what the time of year, you need to be prepared for cold and rain. I was there for 3 months and I had at least 1 light jacket on most of the time. Hey, I live in Norway and can tell you about the weather. If you are planning on biking you have to come between may and august. If you come later than august you may get snowy roads at least in the mountains. At sea level the snow normaly don’t come before october/november, but there is a big differens between south and north. In the north it may snow at sea level in late september. I have seen moust of your Norway trips on youtube, nice to watch. Havent seen any videos from biking the shoreline from Drammen to Kristiansand (in the south). I HIGHLY recomend that trip because of a really nice landscape and tiny narrow wooden villages along the hole shoreline from Larvik to Kristiansand. Another place to see is “møre og romsdal” region, that is the region in Norway with biggest mountains close to the fjords, going from the sealevel to around 2000 moh (6600 ft )in one steep hill. From Geiranger you can bike direct to 1500 moh (5000 ft) in 21 km road from Geiranger, it’s called “nicest fjordview from a road” and really live up to that nicname in a sunny day. Don’t forget “Altlantic Road” the seventh wonder of the world. Enjoy! hi can you post a map of the route ? i was wondering whether you had any maps you can use with gps i.e. memory map ?? so how bad were the midges ?